It’s my favourite holiday of the year. Not because of all the sweets (honest) but because I can legitimately watch all the horror movies I like, and wear skulls, and take the skeletons out of the closet… and of course, carve pumpkins. 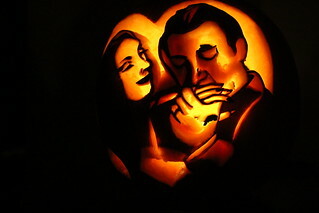 I’ve done a few designs over the years – type in “pumpkin” to the search box here on my blog to see some of my previous carves. I chose my image from the hundreds available, as one which conveyed their relationship perfectly. Taken from the first Addams Family movie with Angelica Houston and Raul Julia in the title roles. I loved those two as Morticia and Gomez. I started out by sketching on the general shapes and filling in some of the detail in red, then slowly putting greater detail in darker colours, once I was happy with the placements. Then I started CUTTING! 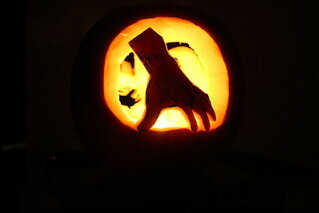 I used a regular kitchen knife, plus a craft knife for the detail. 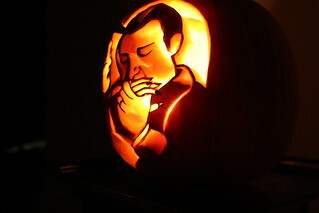 Lighter areas are cut all the way through, while mid-tones are cut into the flesh, and dark areas with the pumpkin skin left on. 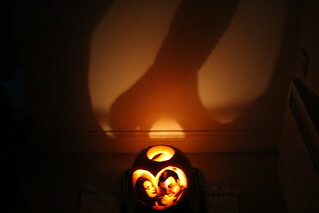 Testing the image at times by shining a torch into the middle of the pumpkin, to check my progress. To frame my subjects, I put them inside a heart shape. Of course! Me, showing the size of the pumpkin. And here’s the YouTube video where you can see the whole thing as I give it a spin! Lastly, I thought of cutting “Thing” out of the back, so that it projects against the back wall. 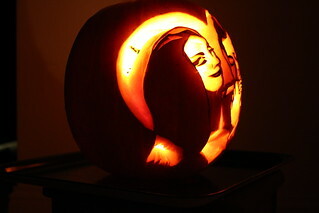 The whole carve took approximately 8 hours! Next time, however, I’ll think more about the placement of the background carvings, as when you cut all the way through both sides of the pumpkin, you can’t then see the front detail because the light doesn’t reflect off the inside of the pumpkin if you’ve removed some of it! As shown in the image below, the projection isn’t all that great this time around. But other than that, I’m pretty happy with the result.